My love for parathas is not new. I have spoken about it earlier and have deep respect for those who make rotis/chapatis/parathas for their loved ones every single day. It takes a whole lot of effort for someone not used to cooking everyday as there are cumbersome steps involved like kneading the perfect dough/atta, rolling out the an even surfaced roti and then cooking it well so that it puffs up. Not all chapatis puff up though. It depends on a number of factors like the quality of your dough, the thickness of the roti, whether it is evenly rolled or not, how hot your tawa is, if the dough has onions, coriander or any other non flour pieces that are big; all these determine whether your chapati/ roti/paratha will puff up or not. But, for starters, kneading the dough with enough water and resting it before making chapatis help to improve the quality of your flatbread to a huge extent. Resting the dough is often overlooked but is essential for the gluten to network in the dough. The perfect dough is the kind that is soft enough to easily break away a pedha, without a struggle. It shouldn’t be sticky (that means it has too much water; add more dry flour and knead) and shouldn’t be very hard either. You could knead the dough by hand or use a food processor like me. Whichever way you choose, you’ll only get better with practice. For those of you who want to dig into the science of the puffy roti I found this interesting thread on quora. Like some one figured out on the thread, they don’t puff up because you were hungry! I do not care so much about the shape or puffiness (for parathas) as I do about whether the roti is evenly cooked or not. Parathas may not always puff up. But if the ‘pedha‘ or the dough ball is folded in certain ways then it can lead to some interesting results. Growing up I’ve seen my mom, masi and dadi roll out parathas in different styles to make different varieties of parathas. There is a normal everyday paratha that my mom makes that puffs up every time. Then there is the lachha (layered) parathas for special occasions that are rolled out by layering the pedha with oil and folding it into a serpentine roll and again layering with oil and folding it into a ball that is then kneaded. Videos to both methods are in our Insta post below. The lachha paratha does not really puff up and is folded and crushed when it is taken off the tawa to reveal/ separate the layers. It is crispy thanks to all the oil used and is great with yogurt, seasonal sabzis, pickles or just on it’s own. And one paratha that is great on it’s own is the one that is kneaded with some extras like leftover dals, sabzis or even fresh herbs. As Dubai gets it’s much needed drop in temperatures, the desire to have seasonal food preparations reminiscent of Delhi winters becomes even stronger. So when I came across a lovely green bunch of methi in the supermarket, I just had to pick it up! This was my first time making a methi parathas. It has always been made for me by someone else so this was a learning curve but I was rather pleased with the results. The proportions of herbs to flour can vary according to your liking. Another factor that you may consider is the form in which herbs are used. Some people make a puree or chutney of the herb and then knead it in the dough. I like it roughly chopped and then kneaded in the dough with other flavours like ginger, green chilli, spices etc. Start by picking the methi leaves from the stems. You can include delicate stems but the thick main stems can be discarded as they are sometimes bitter. Wash the leaves with cold water till the dirt is washed away and drain. Once drained, roughly chop the leaves. While you’re at it, chop the onion and green chillies too. For kneading the dough, in a a wide vessel, place together the flour, salt, ajwain, spices, chopped methi leaves, onion and green chilli. You can add some chopped coriander leaves too but the star of the show is the methi. Slowly add water and work the dough. Keep kneading till you can form a non-sticky dough-ball. Coat with cooking oil, cover the dough and set aside in the fridge for 20-30 minutes. If you are using a food processor like me, throw in everything in the jar except the water. Switch on the processor and add the water in a steady stream from the feeder tube. Stop when the flour turns to crumbs. Wait for the crumbs to move around for a few seconds to form bigger lumps, if they don’t start sticking together soon, add a little bit of water and process more. They will soon start forming lumps and will eventually form a big mass of dough. Let the dough move around for a half a minute, then stop processing and take out the dough. Coat with oil and set aside in the fridge. Once the dough is rested, prepare to roll out the parathas on a clean flat surface with a rolling pin. Place a tawa on medium high heat and keep the oil for cooking and flour for dusting, ready. You will also need a turner for the parathas. Take enough dough to make golf ball size dough balls with your palms. Dust the ball with some dry flour on both sides. Place the dough ball on the chakla or a clean flat surface and roll it into a small even circle. Coat the surface with oil. Start folding the ends in middle till the oiled surface is covered. Dust this dough ball again and then roll it till it is thin and evenly spread by turning and dusting with flour. Note that parathas need not be too thin. Transfer to the hot tawa and cook both sides by turning and oiling. For the lachha paratha version, roll the dough and coat it like in step 4 above but then start rolling from one side to form a serpentine (we like to call it ajgar 😆) like shape. Oil the top and place a small piece of dough in the middle to form another layer. Smooth some oil over this piece and wrap the sides to form a ball. Dust this ball with flour and roll out the lachha parathas to be cooked in the same way as in step 7. Both the rolling processes for the pedha are shown in the embedded video above. 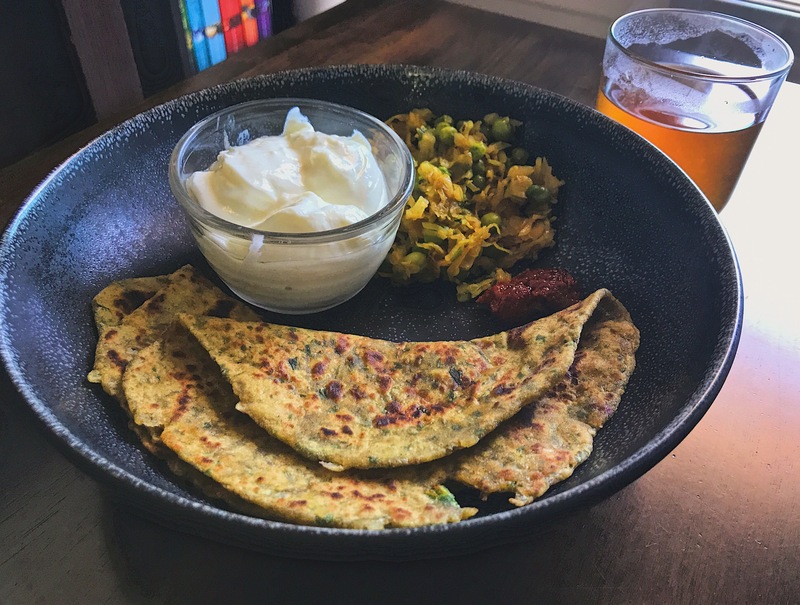 Serve these Methi Parathas hot with yogurt, sabzi, butter or pickle or all of these! While you're at it, chop the onion and green chillies too. If you are using a food processor like me, throw in everything in the jar except the water. Switch on the processor and add the water in a steady stream from the feeder tube. Stop when the flour turns to crumbs. Wait for the crumbs to move around for a few seconds to form bigger lumps, if they don't start sticking together soon, add a little bit of water and process more. They will soon start forming lumps and will eventually form a big mass of dough. Let the dough move around for a half a minute, then stop processing and take out the dough. Coat with oil and set aside in the fridge. For the lachha paratha version, roll the dough and coat it like in step 4 above but then start rolling from one side to form a serpentine like shape. Oil the top and place a small piece of dough in the middle to form another layer. Smooth some oil over this piece and wrap the sides to form a ball. Dust this ball with flour and roll out the lachha parathas to be cooked in the same way as mentioned above. Great videos! I’m more confused than ever, though. What is the difference between paratha, roti, and chapati, naan and kulcha? Good question. The difference is mostly in what goes into the dough but also sometimes in the way it is cooked. Roti and Chapati are generic names for flatbread in North India but also means a simple whole wheat flat breads with no salt and no fat on a griddle or a tawa. 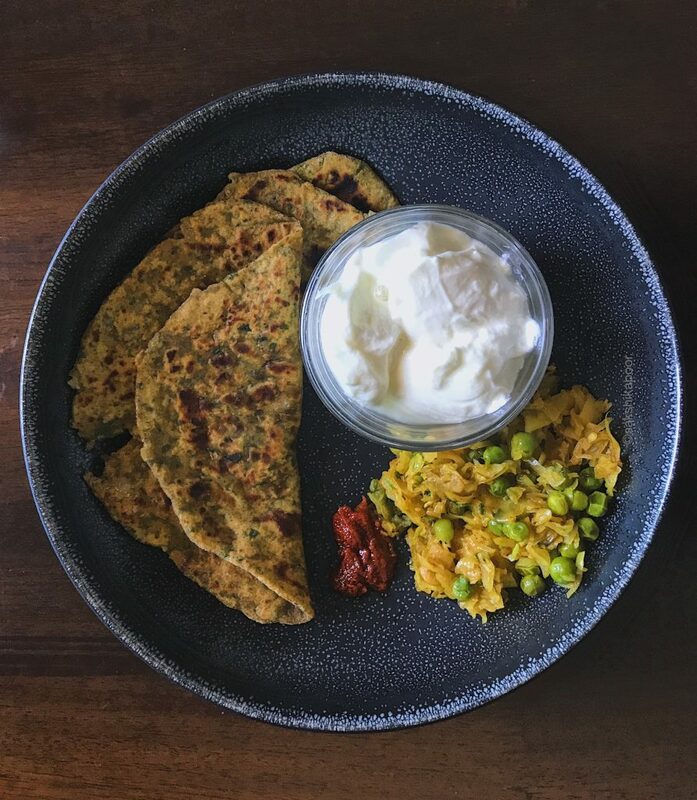 Parathas have a fair bit of fat in the form of oil or ghee (clarified butter) and sometimes salt but are also made with whole wheat flour on a tawa. Naan is leavened bread and the dough sometimes has all purpose flour what we call maida in India. Also has some form of fat, salt and sugar. Naans are traditionally made in tandoor ovens. Kulcha like Naan is also a leavened flatbread but the dough is sometimes kneaded with milk or yogurt instead of water. So in all these, roti/chapati and parathas are made almost every day in North Indian homes while Naan and Kulchas are mostly made on special occasions or just store bought or had in restaurants. Wow! Thank you so much Sakshi! the way you used the names interchangeably made me really question the differences! All I know is that I’ve enjoyed all of them, sometimes stuffed with potatoes and cilantro, but didn’t know how they were made. I tried making naan years ago and it didn’t work well. I appreciate this information! I guess I wanted to talk about the general process of making these flat breads from scratch at home, something that a lot of people from my generation don’t do at all. I haven’t made Naan too many times at home but when I did it came out alright. Will try and share a recipe soon!